One Friday night a few weeks ago I had the opportunity to work under the tutelage of Bruce at his Saltspring Island restaurant. Although I tell people, tongue-in-cheek, that I used to be a chef in an Italian restaurant when I was younger, the truth is that I was just a lowly pizza cook, burning my forearms daily on the oven door and reeking of pepperoni for minimum wage and free pizza-by-the-slice. Since then, pizza has never held the same appeal. I was expecting a similar kind of hell at Bruce’s Kitchen, but was pleased to find a professionally run, familial kitchen where gourmet meals were prepared using only fresh and local ingredients. I’d expect nothing less from an eatery on Saltspring Island, a Gulf Island eden that is so sheltered from most western commercialism that the mere mention of an impending McDonald’s franchise would spur locals to chain themselves to bulldozers and burn clown effigies in protest. Bruce takes pride in all aspects of his food, from farm to table as his slogan proclaims, and his attention to detail is astonishing; even the most basic condiment, such as mustard, mayo or vanilla extract, is made painstakingly from scratch by Bruce himself. For anyone ignorant of the sustenance that feeds them, they need only pass an afternoon in Bruce’s Kitchen watching its namesake chef hard at work. I was there to help Bruce with his renowned Friday night dinners, for which menus were prepared using clever and creative themes that changed on a weekly basis. That night’s menu was of a children’s literary theme, drawing as its muse such works as Cloudy with a Chance of Meatballs (hand-ground lamb meatballs stuffed with fire-roasted red peppers, served on a bed of creamy polenta), Charlie and the Chocolate Factory (chocolate espresso mousse) and the classic Green Eggs and Ham (kale ravioli). It was this last dish that I aimed to duplicate at home, it was so good. I have used my pasta maker previously to make ravioli, but the pasta turned out bland and misshapen by the time it landed on my plate. 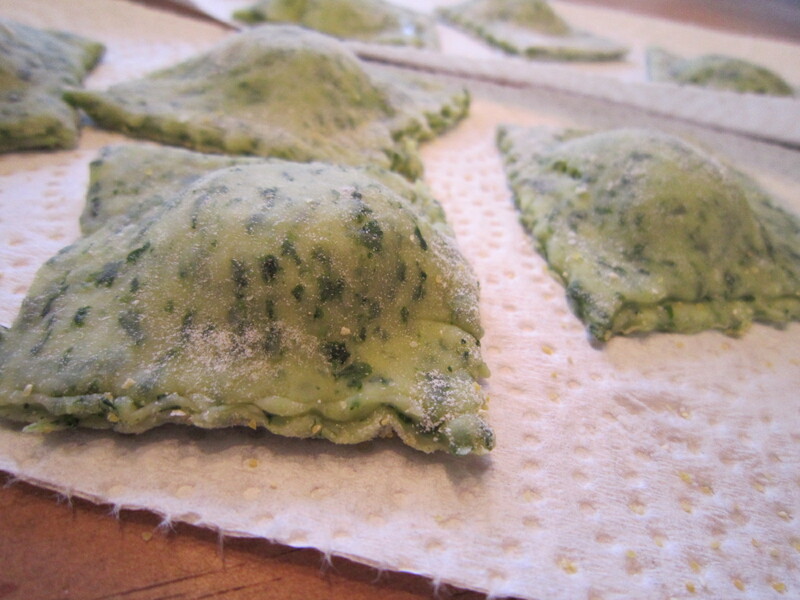 To remedy this, Bruce used a ravioli cutter or pastry crimper to properly shape the ravioli; so I took note and picked up my own afterwards. To liven up the taste and colour of the pasta, he mixed in chopped kale. I couldn’t remember the exact recipe, a few weeks after the fact, but trial and error gave me a finished product that I was pleased with. Thanks for the inspiration, Bruce, and for your patience with my endless questions.